With me two previous blogs I have reported on special sessions in the European Conference on Educational Research (ECER ’15) in Budapest (8.9.-11.9.2015). In the first post I reported on the symposium that was initiated by our EU-funded Learning Layers (LL) project team in Bremen. In the second post I discussed sessions in which similar intervention projects were presented. With this third post I will summarise some general impressions on the conference and give snapshots on some further sessions. The conference took place in Hungary – one of the countries in Central and East Europe (CEE) that went through a fundamental societal transition after the fall of the Iron Curtain in 1989. During this year of ruptures Hungary had played a major role in cutting the barbed wires that separated different blocks in Europe and by opening its borders to those who wanted to seek refuge in the west. During the years of transition the political and educational culture of the country went through different phases of transition – including the phases of Candidacy to EU Membership and the entry to Membership in 2004. Already during the phase of candidacy, Hungarian researchers has been involved in European cooperation and taken their place in the joint activities. Yet, it took some time before the Hungarian association of educational researchers joined the EERA family. Now that this had happened, we were pleased to see the conference taking place in Budapest. Yet, by the time the conference dates got closer we felt concerned about the humanitarian crisis that was characterised by masses of refugees coming to Hungary (with the hope to continue to Austria, Germany and eventually to Scandinavia). The measures of the Hungarian government (building fences and trying to block the streams of refugees) did not appear compatible with European values – neither could they resolve anything. Therefore, before and during our conference we saw reports on refugees camping at the borders or railway stations, marching on the highways or seeking for transport to safer countries. As I said it – we saw this from the news, not in the vicinity of the conference venue. Knowing all this, we were pleased to observe that the EERA secretariat and the EERA council appealed the participants to support petitions and fund-raising to ease the burdens of refugees. The European network for research in Vocational Education and Training (VETNET) has had a tradition to organise an opening colloquium in which the host country is recognised. From this perspective we were pleased to have as the keynote speaker of this session professor Andras Benedek from the Budapest University of Technology, former Director General in Vocational Education and former Minister of Education. He informed us both on the developments in the educational policies in post-transition Hungary, on recent reforms in vocational education and training (strengthening of workplace learning and the role of chambers) and on the current model for vocational teacher education. In addition to his scholarly presentation he invited us to get a picture of the human side of Hungarian civil society, the openness for Europe in many NGOs and the willingness of individual citizens to help the refugees that entered their country. We would have hoped to get more information in this colloquium on the post-transition developments in Hungary and in other CEE countries. For several reasons this was not the case. In a later paper session the local support person of VETNET, Magdolna Benke gave a presentation in which she informed of the short history of the National Institute for Vocational Education and her empirical studies to trace new developments in building partnerships to support the development of VET. My impression is that we still have some homework to do for further ECER conferences to learn more of transitions in VET during the post-transition period in CEE countries. Nordic Countries in Budapest – Learning from Nordic Countries? Altogether, I was mostly happy with the sessions that I attended at ECER’15 and I got new inspiration to work further with the themes that are close to me. This is even more important now that were are preparing the next ECER conference as the one in which the VETNET network will celebrate its 20th anniversary. In this respect I will discuss the VETNET general assembly and the future plans of the network in my final post on ECER’15. In my previous blog I started writing out memories on the process that led to Germanunification in the years 1989-1990. This is my contribution – as a Finnish expatriat working in Germany – to the celebration of the national holiday – the Day of German Unity. But, as I mentioned in my previous blog, these events have a more personal meaning than news from foreign countries. It so happened that during the turbulent October-November days 1989 I was on a a five weeks’ study visit in Germany. And in the beginning of October 1990 I was again in Germany as a participant of a conference that was organised during the days of the unification. In the previous blog I have tried to reconstruct the chain of main events. Now I try to refresh my memories on how I observed the events when travelling round Germany in 1989 or witnessing the day of unification in the middle of a German conference. I had planned a five weeks’ tour starting from North Germany (Bremen, Hamburg), then continuing via Kassel and Göttingen to the Ruhr area (Dortmund, Düsseldorf), then having a stop in Bonn, making quick visits to Karlsruhe and Frankfurt, then spending a Week in München (Munich if you insist) and then spending the last week in Berlin. My aim was to get to know the main research institutes in the field of vocational education and training (VET), industrial sociology (social shaping of work and technology) and educational policy research (with emphasis on VET). From this perspective the trip was successful – I got a lot of fresh insights and made several good contacts. In particular, my long-term cooperation with Institut Technik & Bildung (ITB) started from that visit. But in this blog I do not wish to go to those aspects of my study visit. Instead, I try to reconstruct how I experiences the turbulent times in the German-German history while travelling in Germany when great changes were on the way to happen. During the first weeks in North Germany the most striking news were the arrival of the masses of refugees that were evacuated from the embassies where they had been camping. It was striking, how great their expectations were on their personal future, now that they had managed to escape and start a new life. However, they had to adjust themselves to rather inconvenient temporary accommodation before they could get settled. Also, getting used to market economy with consumer goods richly available – but with market prices – was not easy for all. People told stories of young men who had just got their first jobs and immediately tried to order top class BMWs. During the next weeks’ travels from Kassel to the Ruhr area and to Bonn the news focused more on the mass demonstrations in different cities of the German Democratic Republic (DDR). Also, we started to get insights into the difficulties caused to the DDR economy and society by the mass exodus of people to the west. Key functionaries and key professionals had left their posts and fled away – the organisations were struggling to cope with less people available. In particular in the healthcare sector this started to be a problem. At the same time the ones who continued with protests became more determined. During the visits from Bonn to Karlsruhe and Frankfurt I heard the first news on changes in the leadership of DDR. The top man in the leadership, president and party leader Erich Honecker had stepped down. Yet, it was not clear, whether this would be just a minor face lift with some of the oldest representatives of the ancien regime stepping aside, whilst younger technocrats would try to save the regime. During the week in München the uncertainty of the future course was still there. There were new waves of refugees via embassies. The demonstrations were continued with growing number of participants. And some other key persons in the leadership of DDR stepped down. Yet -what was to be expected. My host organisation, the sociological research institute ISF had planned a comparative project on industrial relations and working conditions in several countries and they had invited a promising young researcher from DDR to join in the consortium. She was also invited to give a speech on this topic in an event of the Civic Academy of München. Her speech was received well and the discussion started exploring other issues of public interest. When asked directly of her opinion on the recent events, the speaker shocked her audience by stating that she will not return to DDR. She had no confidence that the things would turn better. During the week in Berlin I got the chance to understand what it means to live in a divided city and in an insular city that has been surrounded by walls. Indeed, the Berlin wall was there and you had to climb to the terraces on the western side to see the Brandenburg gate and the sites in the East. The protests kept going on and the West-Berliners were getting sure that the regime in the East is losing control. A taxi-driver’s comment was symptomatic: “They have mismanaged their economy and the political leaders have no control. If they get a chance for free election, they will vote for unification.” At that time many key persons in the protest movement were still hoping to find an alternative course for their DDR – not to push through a unification with the superpower in the west. Few days after my return to Finland the ancien regime lost the control irreversibly, the wall was opened, the offices of the secret service were abandoned and the demonstrators caught the last agents that were trying to delete documents. And the big wheels started rolling towards the unification. Almost one year later I had a chance to visit Germany again. I had a chance to participate in the German umbrella conference on pedagogics of vocational education and training (Hochschultage Berufliche Bildung). Originally this conference was supposed to take place in a West-German university. However, the designed host organisation had to give up the plan. Therefore, the national organising committee made an arrangement with the University of Technology in Magdeburg to organise a West-German conference in DDR. This was understood as a a friendly gesture to support the gradual coming together between the two German states after the wall had been opened. However, real life was much faster than anyone had anticipated. The process of gradual coming together turned into rapid unification. To the great surprise of the organisers they had to cope with the decision that the final day of the conference would be the day of unification – and a new national holiday for the unified republic. The organisers decided that they will celebrate unification by continuing the conference as had been planned. When I arrived in Magdeburg I realised that the conference was heavily overshadowed by the forthcoming unification. The mode of unification was to join the DDR area as new federal states into the Federal Republic of Germany (BRD). In this way the Federal legislation will come into force in the new states. This caused a lot of anxieties among the people who had to cope witt legal and organisational rearrangements. These discussions overshadowed many of the sessions. The East-German participants tried to highlight what they felt was appropriate in their system of VET. The West-German participants tried to show solidarity and understanding. They also were pleading for flexibility and creativity in the the process of systemic transitions in the field of VET. Due to the timing of the conference it got some attention from top-level policy-makers. The last Minister of Education and the last Secretary of State of DDR were attended the conference and completed their missions in these positions. The Federal Minister of Education of BRD had promised to attend during the opening panel discussion. He arrived – just in time – and gave a speech with which he indicated, who is the new master in the house and whose rules count from now on. Then, contrary to his promise, he apologised that he had to leave at once because of an important appointment in his West-German home town. So, he missed the speeches of the Minister and Secretary of State of DDR (who gave their last speeches in these positions). On the way back from the conference I and the other Finnish delegate experienced a complete traffic chaos in Berlin. We were supposed to have plenty of time from the railway station Berlin Schöneweide to the airport Berlin Tegel. But the streets were full of people who wanted to get to the City centre to witness the special session of the parliament in the Reichstag building and/or the nearby events. Also, when we finally got to the airport, the plane was kept waiting because the Members of Parliament kept coming on charter planes to attend the session. Finally, we got a permission to fly away (but we missed our connecting flight and got an extra dinner in Hamburg, courtesy to flight company). In the meantime the prominents had their celebrations in Berlin. The picture that was taken on that evening was symptomatic – we see the Mayor of West Berlin, Mr Momper, the old Chancellor Willy Brandt, the Foreign Minister Genscher, the Chancellor Kohl, his wife Ms Kohl, the Federal president Mr v. Weiszäcker waiving their hands – and just fitting to the picture the last Prime Minister of DDR, Mr de Maizière. The new era had been started. I guess this is enough with these memories. I have had to witness important events from close vicinity. Little of this could be understood immediately on the spot. The big picture could only be reconstructed afterwards. It is time to end these stories now that the Day of German Unity is turning into evening. 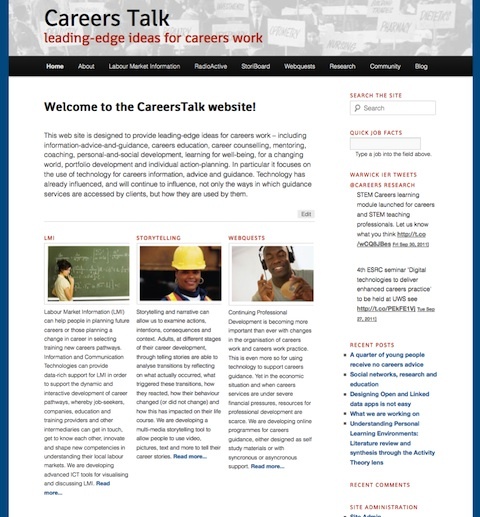 We are happy to announce the launch of a new webs site, CareersTalk. The site, developed jointly between Pontydysgu and the Institute for Employment Research, Warwick University, provides access to the ongoing research and development we are undertaking into careers guidance and in particular, the use of new technology to support careers guidance. Much of this work has been undertaken with support from the EU Mature-IP and G8WAY projects. The web site also provides links to working versions of our data visualisation tools. I have spent much of the afternoon reading the UK Commission for Employment and Skills report on The role of career adaptability in skills supply. The report was written by my colleagues Jenny Bimrose, Alan Brown, Sally Anne Barnes and Deirdre Hughes from the Institute for Employment Research at Warwick University. It is particularly pertinent to our ongoing work on career transitions and Web2.0 and this post forms the first of two looking at some of the central ideas in the report. Research in careers is limited yet careers choice and careers guidance are increasingly important with fast changing technologies and the world financial crisis rendering many occupations and jobs increasingly insecure. Few young people today will spend their entire working life in one occupation. The report based on empirical research undertaken in the UK and Norway looks at how people adapt to such a situation and how we can better support people through career transitions. describes the conscious and continuous exploration of both the self and the environment, where the eventual aim is to achieve synergy between the individual, their identity and an occupational environment. Developing career adaptability has a focus on supporting and encouraging individuals to be autonomous, by taking responsibility for their own career development. The operational definition of career adaptability used for this study was: ‘The capability of an individual to make a series of successful transitions where the labour market, organisation of work and underlying occupational and organisational knowledge bases may all be subject to considerable change’. ‘career’ belongs to the individual, not to the employing organisation (Duarte, 2004). concern refers to stimulating or developing a positive and optimistic attitude to the future. (Savickas et al., 2009, p.245). Learning is obviously important in developing career adaptive competences, particularly learning through work. The role of learning in developing career adaptability at work has four dimensions. The first involves learning through challenging work: mastering the practical, cognitive and communicative demands linked with particular work roles and work processes. The second has a primary cognitive focus and involves updating a substantive knowledge base (or mastering a new additional substantive knowledge base). Knowledge updating may play an important role in extending adaptability beyond a focus on the current work role. The third dimension has a primary communicative focus and comprises learning through (and beyond) interactions at work. Finally, the fourth dimension focuses upon how career adaptability is facilitated by individuals becoming more self-directed and self-reflexive in their learning and development. One special aspect of being self-directed, illustrated by the quotes above, relates to being self-reflexive, able to identify your current skill set and how this might be enhanced and extended. Those who made successful transitions all seemed to be self-directed in either or both their learning and development and their career more generally. The link between being self-directed in your own learning and development and making successful transitions is transparent: if you can learn to adapt and continue to develop in your current job, even in less than ideal circumstances, then this provides a basis for making successful transitions in future. Several participants also pointed to the psychological dimension of how being self-directed and successful in making a major transition reinforced your confidence that you would be able to do this again in future, if required. Those individuals who see that their skills can be transferred to other contexts have significant advantages in changing career direction over those who define themselves almost exclusively by their occupational and organisational attachments (Bimrose et al., 2008). This advantage stems from the former having a dynamic sense of themselves as being able to navigate their own route through the labour market, whereas the latter are dependent upon the pathways linked to a particular organisation or occupation. However, the research based on a psychological-social approach, also recognised the importance of opportunity in careers transitions and the multiple-disadvantages many face in the labour market, especially in the UK, as opposed to Norway where class plays a lesser role. It also recognises the role that different labour market and education structures (and regulation) can play with regard to opportunity. The research approach was particularly interesting. In the EU funded G8WAY project we have been looking at the potential of storytelling, both as a research methodology or tool., and for helping young people reflect on education transitions. The career adaptability study also adopted a story telling approach. The research study reported here adopted a retrospective and reflective approach – asking adults to reflect on their experiences of labour market transition, comment on the strategies they deployed and what, with the benefit of hindsight, they might have done differently. This approach has analytical power in that it enables individuals to ‘tell their career stories’, who invariably respond well to being given an opportunity to do so. Most individuals in our sample constructed coherent career narratives that had a current value in offering perspectives on where they were now, had been, and were going in their work lives. It could be argued that the career stories of some individuals may have been partly based on past events that have been reinterpreted from how they felt at the time they occurred. However, this misses an essential point about career adaptability: it is how the past is interpreted and reinterpreted which can act as a trigger to positive engagement with education and training when faced with labour market transitions. Hence, it is the stories in which we are interested, rather than searching for an unobtainable ‘truth’ about their attitudes and behaviours in the past. This reflective approach has provided deep insights into dominant features that characterise an individual’s career adaptability profile, namely: individual (personality) characteristics; context and opportunities (opportunity structures); learning and development; and career orientation. These features are in constant and dynamic interaction, one with another. One final aspect of being self-directed surfaced in many of our participants’ replies – people can learn from their lives through the stories they tell about them. Many of our participants recounted powerful narratives of where they had been, where they were and where they might be going. They were in charge of their own stories and such a perspective itself is an important component of adaptability. I am still interested in experimenting with different formats for conference presentations. Of course the call for contributions and formats for different conferences will limit the possibilities (as often does the design of the conference environment). The European Conference on Educational Research offers the possibility for workshops but, in may experience, there are very few workshops and all too often it is difficult to tell the difference between a paper sessions and a workshop sessions. ” A major characteristic of European societies is the rapidly growing differentiation of educational pathways, opportunities and biographies. This increase in complexity requires great effort from learners into initiative taking, creativity, problem solving, risk assessment and decision taking. Through the past years various structures have been developed in order to support students in mastering educational transition. However they have been often formulated in an institutional perspective, discounting learners’ experience and creativity skills as well as new opportunities of technology enhanced learning. The research workshop is based on the European Commission funded G8WAY project. G8WAY is based on the idea, that the growing availability of web 2.0 tools allows for bridging this gap through learner centred and connective approaches, with a chance to more effectively manage educational transition. Thus, G8WAY is developing web 2.0 enhanced learning environments, which will enable learners to reflect and develop creativity potentials and transitional skills in the light of self and others’ learning experience, made visible through a variety of media sets and PLE tools, each of them designed to meet the requirements of transition envisaged, and all of which are mapped into one single pedagogy framework. For each of the scenarios a problem oriented concept and case based reasoning method will be developed and embedded into a web 2.0 learning environment to facilitate reflection, case based reasoning and experimental learning on self and other’s learning experience across different educational contexts and towards the development of transitional skills. To this purpose G8WAY will develop web 2.0 learning environments combining a variety of media sets and ICT enhanced learning tools, which are connected through a single pedagogy framework. The research workshop is intended to form an active part of the G8WAY project, allowing connection and input from the wider educational research community to the projects work and outcomes. It all sounded very fine when I wrote the proposal last January. But the proposal didn’t require me to say HOW i was going to design and run the workshop. I only had one and a quarter hours and to make it worse the workshop was scheduled for the final confernce session – after lunch on a Friday afternoon. What I wanted to do was to go beyind brainstrorming or group work around teh main ideas of the project and inclove particpants in the ongoing research of the project. The G8WAY project has been undertaking a series of ‘case studies’ of transitions, based on a story telling approach. To date we have gathered stories from 60 people, in six different countries. We have published the stories on the G8WAY project web site. At the present time we have two working groups who are looking at the school to university transition case studies and the university to work case studies with the aim of deriving a limited number of persona. These persona are intended to provide a basis for developing social software to assist young people in educational transitions. Of course, without the original case studies this feedback makes little sense. But there was a genuine enthusiasm and interest form participants both in our work and in the process. This has led me to think if we should not extend the exercise,through our project web site, allowing those who are interested but not a project partner to contribute to the project research. Of course that raises the question of why anyone would want to participate voluntarily in ‘Open Research’? The answer I think lies in the relation between research and learning. Participation in a research project can be a powerful form of learning or professional development. I am constantly being asked to fill in questionnaires and surveys to support different projects. But seldom does the opportunity for involvement go beyond that. It will require some creativity and imagination, but I see no reason why we shouldn’t start opening up our research to all those interested. And that is not just the obligatory bulletin board for visitors to ask questions or add a comment. It means redesigning the research methodologies and processes to allow others to participate. More to come in a future post…. Posted in G8WAY, research, teaching and learning, transitions, Wales Wide Web | Comments Off on Open Research?